Reluctantly we wrapped up our Yosemite visit and headed off to South Lake Tahoe where we planned to spend the night. This involved quite a lot of driving. We travelled up Route 49 through the middle of gold rush country in California. Cindy provided navigation that cut quite a few miles off the trip. Many of the old towns along the way had put out Christmas decorations. One small town had a theme where they wrapped every vertical pole in town with tin foil and red ribbons. Route 49 took us to Placerville where we joined Route 50 to South Lake Tahoe. We arrived in South Lake fairly late and easily resisted the urge to go gambling at the casinos. The next morning we ate breakfast at Heidi's, which was okay but expensive, then set out for Bodie. Bodie is a small gold and silver mining town on the high desert east of the Sierras that was founded in the late 1870's and abandoned in the 1940's. The town is now administered by the California State Parks Service. We had a lot of driving to do to get to Bodie. We had to drive across the Nevada border then up and out of the Lake Tahoe basin then south along Route 395 which follows the eastern wall of the Sierra Mountains. Once we reached the Bodie turn-off the driving got much more interesting. The road up to Bodie was gated shut, so I drove the car around the gate via a small dirt turnout. 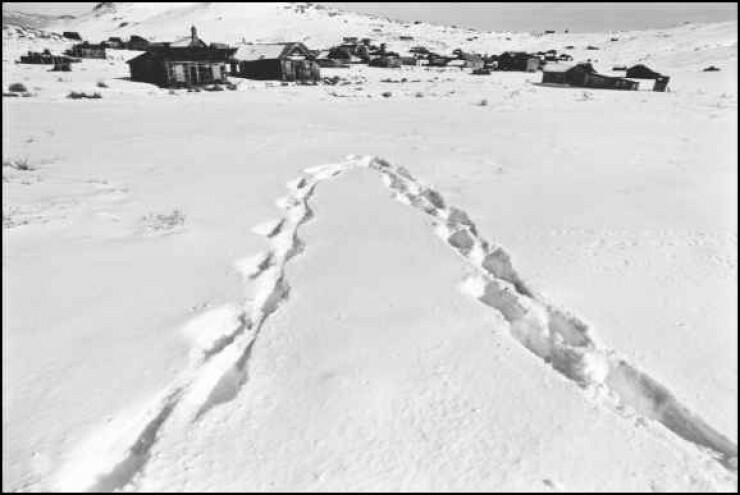 A fair amount of snow had fallen at 8000 feet the previous week but the road up to Bodie had been plowed. The day was warm enough that the little bit of snow left on the road was melting. After about 10 miles the pavement gave out and the road became dirt. The next two miles of road had also been plowed but there were still plenty of patches of ice and snow mixed in with frozen mud. I had to fight the car a few times when it wanted to head off down the hill at the edge of the road and I preferred that it stay on the road. Cindy's knuckles were white and she wasn't saying much. Eventually we reached an open area in the road where the plow had turned around and the road was no longer passable. There were several state ranger four wheel drive vehicles parked here. From this point on it was only possible to walk, ski, or snowmobile into Bodie. Having no skis or skidoos available we decided to hoof it the last mile into Bodie. Walking a mile through packed snow at 8000 feet was a moderately demanding chore, and it took about forty minutes for us to get down to where we were a hundred yards or so from the town. There, to our dismay, we found that we needed to walk a wide loop around town along the packed snow trail to actually get into town. We were considering whether it would be a good idea just to head out over the two feet of fallen snow directly into town when we noticed the footprints of a traveller who had the same idea. We decided to stick to the trail.